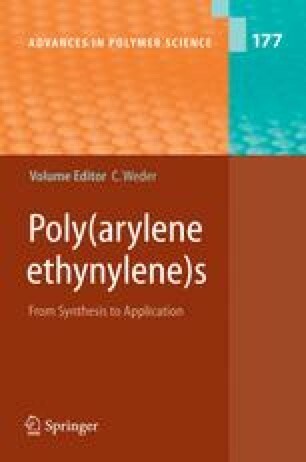 This article reviews the synthesis and chemical properties of poly(aryleneethynylene)s, PAEs, consisting of sulfur-containing heteroaromatic rings (e.g., thiophene), nitrogen-containing heteroaromatic rings (e.g., pyridine), and silicon-containing heteroaromatic rings (e.g., silole). The polymers are usually prepared via Pd-catalyzed C–C coupling between diethynyl compounds and dihalo organic compounds. However, synthesis using other monomers such as distannylacetylenic compounds is also possible. This article describes the chemical and optical properties of PAEs, which are affected by the basic electronic properties of the heteroaromatic ring and the molecular structure of the PAE.